So I decided it was finally time for me to start using an airbrush. The main reason would be that it saves me quite a bit of time when painting and certain results are much harder to pull off when using a brush. I’ll still remain a dedicated brush user while experimenting with the airbrush, I can think of a multitude of things I simply won’t be able to pull off with an airbrush for a long while. To get me started I asked others who are more experienced with an airbrush to give me some directions on what to buy. Something I would advise everyone starting out, as it can be a bit tricky to choose the correct setup when starting out with no prior experience. The airbrush I got is the Badger Renegade, a dual action airbrush with a top feed. I can confirm that you really need to tune it a bit when you first use the airbrush. My first assumption was that it would be set somewhat ok so I could start spraying straight away, however this is not the case. Fortunately tuning the setup of the airbrush isn’t rocket science. I’m not 100% sure which model compressor I have so I’ll get to that in a future article. I started out giving priming a try. 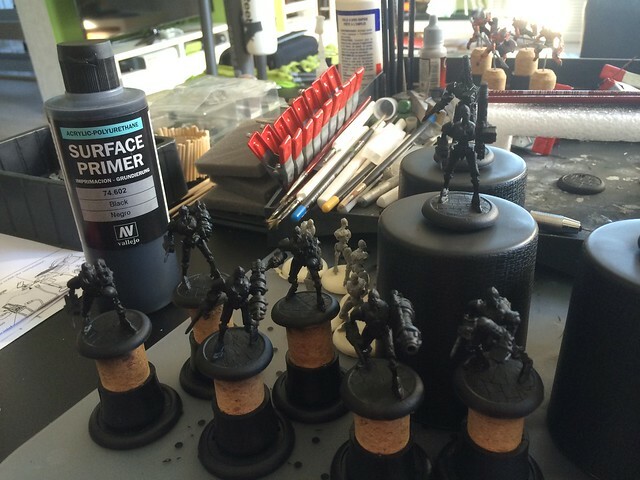 When I primed my minis before I used a spray can, and I sprayed from 4 directions (front, back and both sides). This meant spraying one side on one or more mini’s, letting it all dry for a good 5 minutes, turning the models and spraying the next side. As a result priming a model would always take me anywhere between 30-40 minutes. Because with spray priming I noticed that black primer made it much harder to see the details, and white primer isn’t always a good plan when the end result needs to be dark, I always used grey primer. At the LGS they only had the black airbrush primer in larger size bottles (in stock, I’m sure the can order the other one’s) so I decided to give the black primer a go. 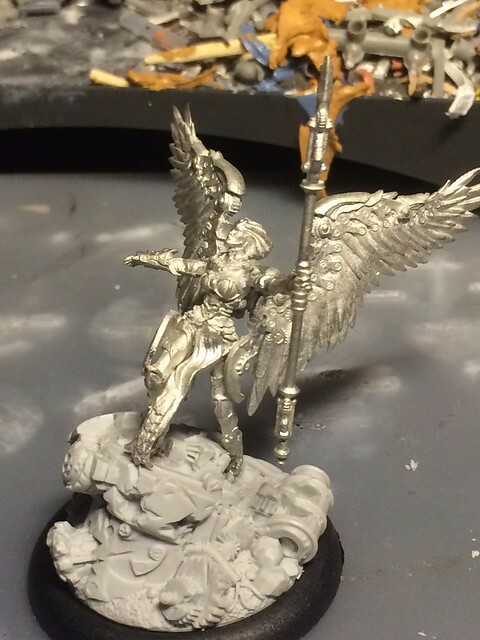 I primed a unit and was amazed at how the details were all visible with the black primer. I will most likely use black / gray or white depending on the final result I’m going for, but it’s really nice to know that with the airbrush I can have such a nice result when priming in black. 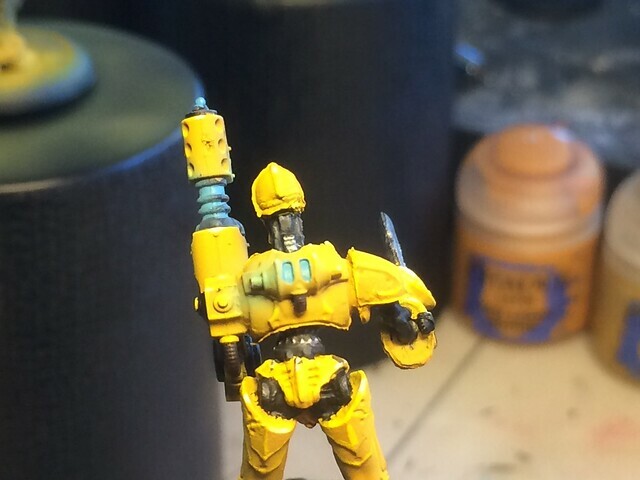 Since I felt I wanted to see just how amazing airbrushes could be I decided to make my first test layers yellow. 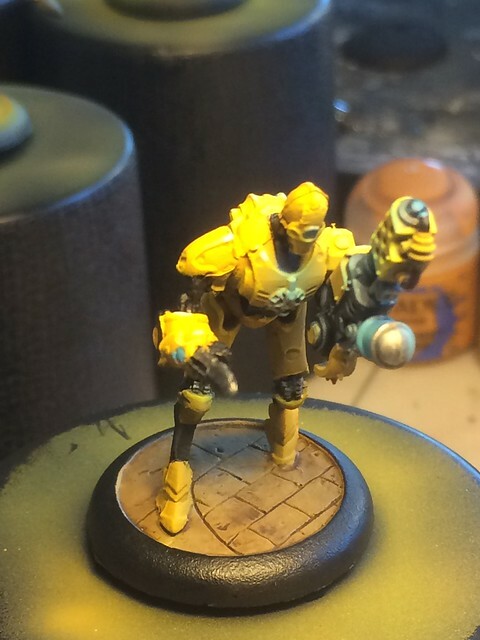 I wanted to test out a new scheme for Convergence and at the same time see what my options were for applying yellow (a color notorious for not being easy to paint). 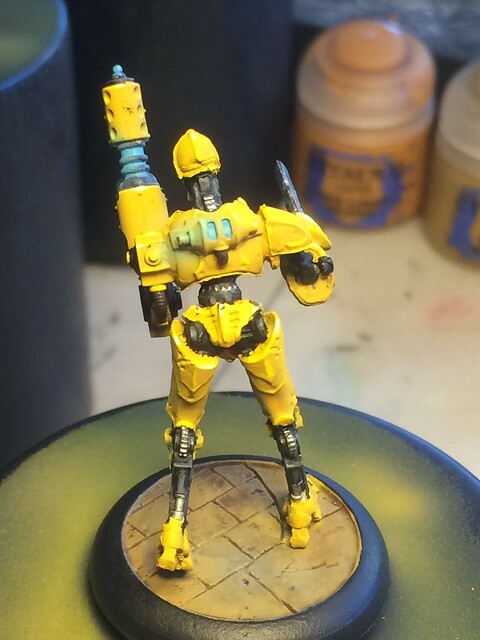 The first conclusion was that even over a black primer yellow covered quite well using the airbrush, which was an amazing thing to find out. 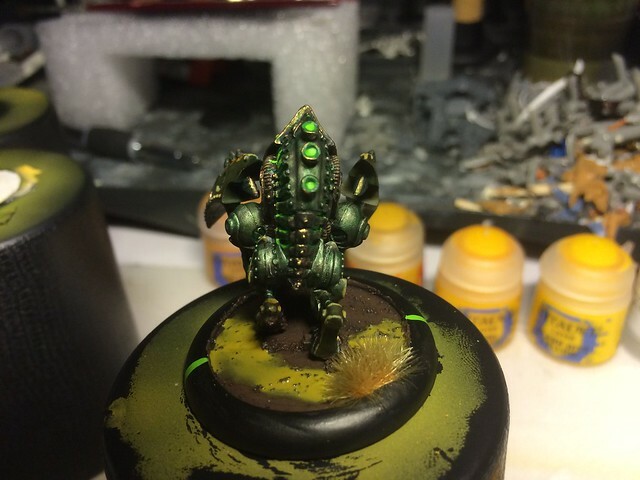 I experimented a bit more and while in the end the shadows I was hoping to create were far from what I was hoping to achieve I did manage to get a nice color transition on the model and I was even able to pull off a slight osl effect. 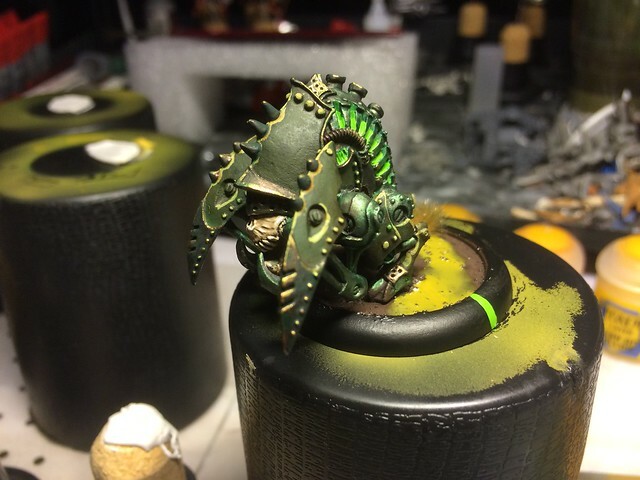 Applying that osl made me realize I won’t be doing this on the models I’m trying to get above tabletop quality as it can ruin a model that is otherwise painted really well, and I want to practice more. Still the result is not too bad for a first try. I did some panel/ edge highlighting to make it pop more ofc. 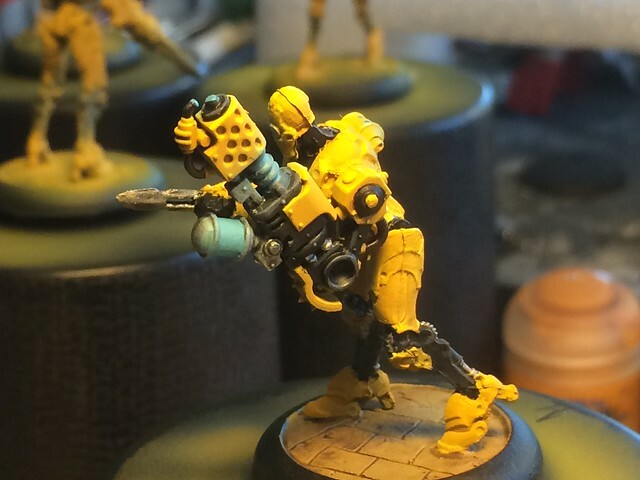 Painting yellow was fun, but a more practical test was required to really see if I could start applying airbrush painting for my regular painting schemes. I still hadn’t gotten around to painting my Helldiver so he was my primary victim. He was already primed so no priming to do but no real problem. 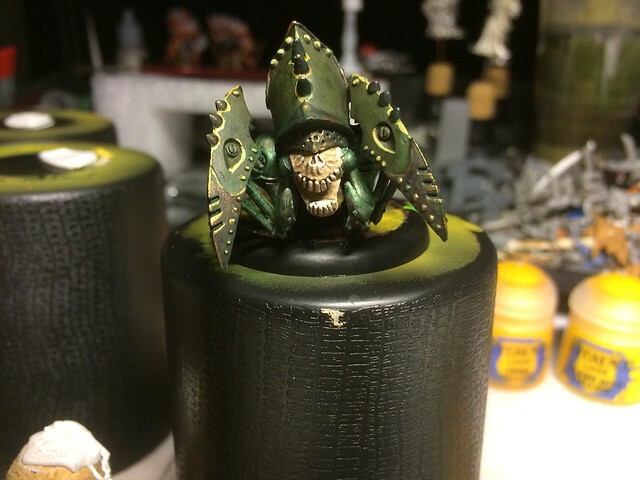 I normally base coat the armor plates on Cryx jacks with Caliban Green and then layer over it with Castellan green. Now I repeated this process using the airbrush. The result was more than ok, it saved me time and it was smooth as silk. I applied the usual washes and edge highlights to the plates and finished the rest of the model as before with the brush (too much detail work/ not using masking yet so airbrush was out of the question for the other areas of the model. Tonight I will start working on an objective marker I have Created using the Aurora model and a Convergence wreck marker. I may even try out using some pigments on it, no sure yet. 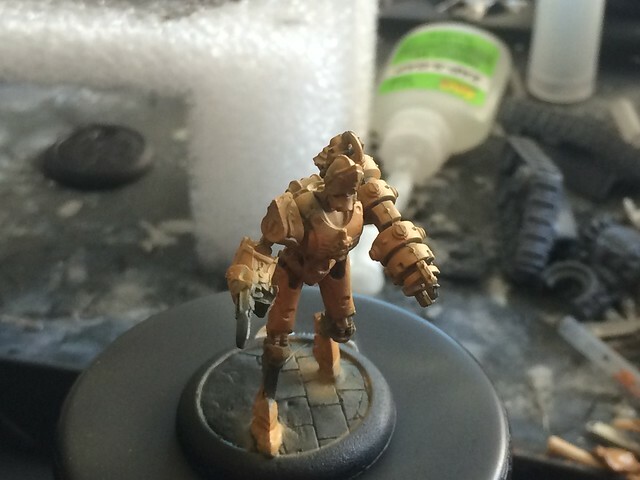 Here’s a teaser of the unprimed / unpainted model. 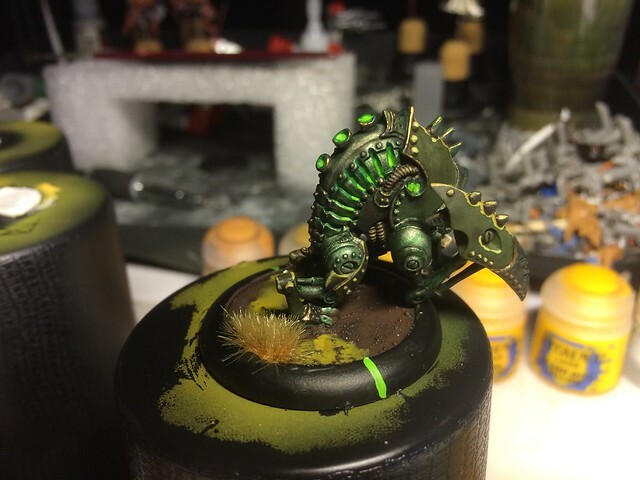 This entry was posted in Convergence of Cyriss, Cryx, Painting, Warmachine by Tolteks. Bookmark the permalink.